I've got magazines....a LOT of magazines. Bead magazines. I'm a 'self-taught' beader. In the years I've been beading, I've never taken a formal class....but that is not to say I haven't learned from anyone. 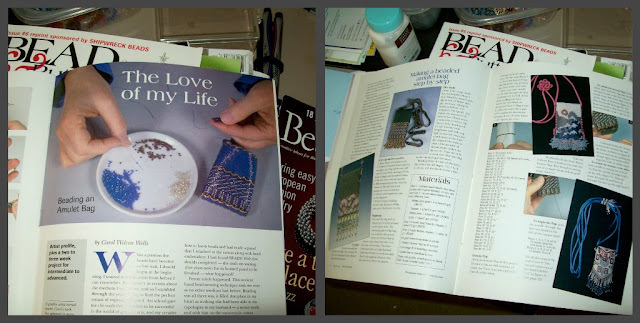 Books about beading are great - but what is even more exciting is a bead magazine. They come around quite frequently and they are chock-full of information, instruction and inspiration. My two stand-bys are Bead & Button and Beadwork. Since then I've collected quite a few bead magazines. 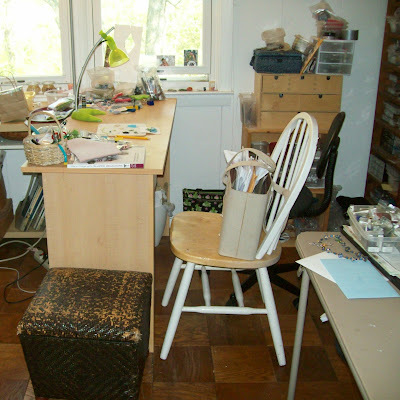 I store them under my beading table (above left), behind my beading table on a shelf (above center), on top of bead trays and under bead storage (above right). So many magazines, that I have to pack some of them away. See that dark wicker box, next to my beading table? 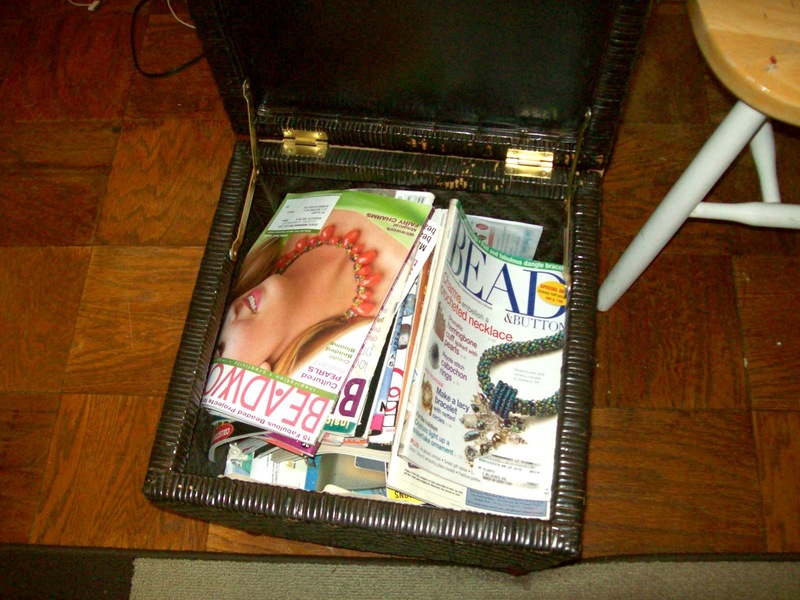 Open that baby up and there is a treasure chest of almost two decades of bead magazines. Check out these vintage issues! These old Bead & Buttons are from 1995, 1994 and 1994 (left-right). Even back then, they sure were inspiring. 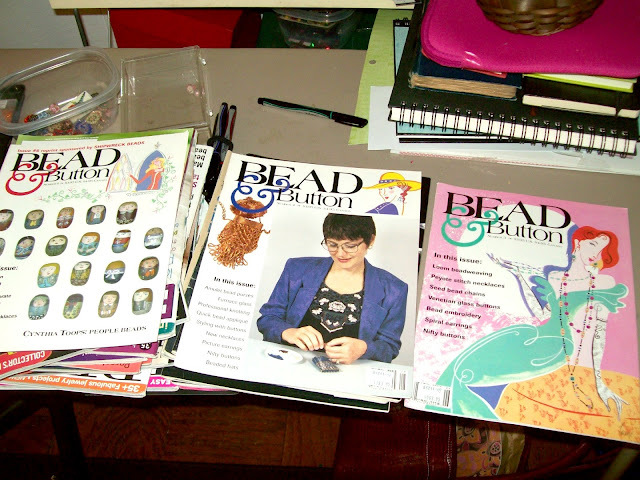 Bead magazines have played an integral role in my beading life. I've learned so much from working on magazine projects. It's really fun some days to just randomly pull a magazine from that big wicker box and see what was popular or starting to trend in years past! You can imagine my delight...when thanks to the fantastic idea of Karyn at Releases by Rufydoof....a piece of mine found it's way into a bead magazine last month (along with some gals I think are pretty terrific)! Getting into a bead magazine has been on my 'bucket list' for many, many years....but I never really pursued getting myself into one. So THANK YOU Karyn for being the brains behind Beading Babes! 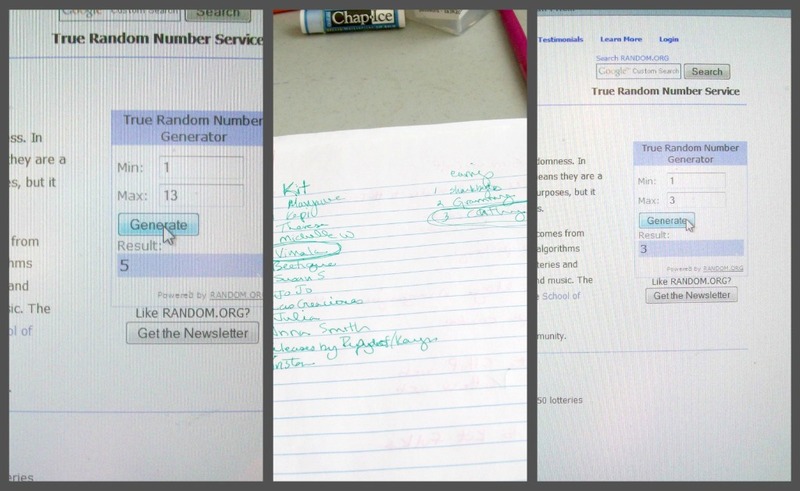 The winner of the kit, is Vimala of The Bead Diaries. The winner of the earrings is Cathy of Life on the Muskoka River. Well, I can't believe it's M and the challenge is HALF WAY OVER! Wooo hooo! Looking forward to the final 13 letters of the alphabet! I know what you mean about magazines,Amy! I love all kinds of magazines, beading, knitting, home decor, you name it, I love it. They do get overwhelming at times. But, the ideas you can get from them are fantastic!! My wife worked in the magazine industry for many years so we also have loads! I trust you are already following my friend Jean over at "Snap Out of It." She's a hoot. Good luck with the rest of the challenge. That is a wonderful stash of Magazines. Mine go back to 2004. I too am glad that Karyn had the terrific idea to start an on line beading club. I'm also proud to be published for the first time with you and Kristen, I am in awe of y'all's beading ability. I used to get Bead & Button in the mid-90s, and over the years have subscribed to others. Due to space constrictions, I have cut them all up, saving pretty pictures for my "Book of Pretty Things" and putting instructions for projects into my giant 3-ring binder of ideas. My fundamental problems w/ these magazines is that there are WAY too many ads especially breaking up the project instrux, and I find myself saying, Who would WEAR that? with many of the projects. Still, they have served as a great source of inspiration. Yay, I won those awesome beads! Thank you Amy...ooh, I'm so excited! I love getting beads in the mail! I too have a huge stash of B&B and Beadwork magazines...I have every issue of Beadwork and my B&B stash starts with issue #23 in 1998...I love all of them and hope that I will be able to keep them as the stash continues to grow with my subscriptions! haha! And bead magazines are the only time that I don't mind the advertisments...at least they are ads for beads rather than perfume or cars or diapers...haha! 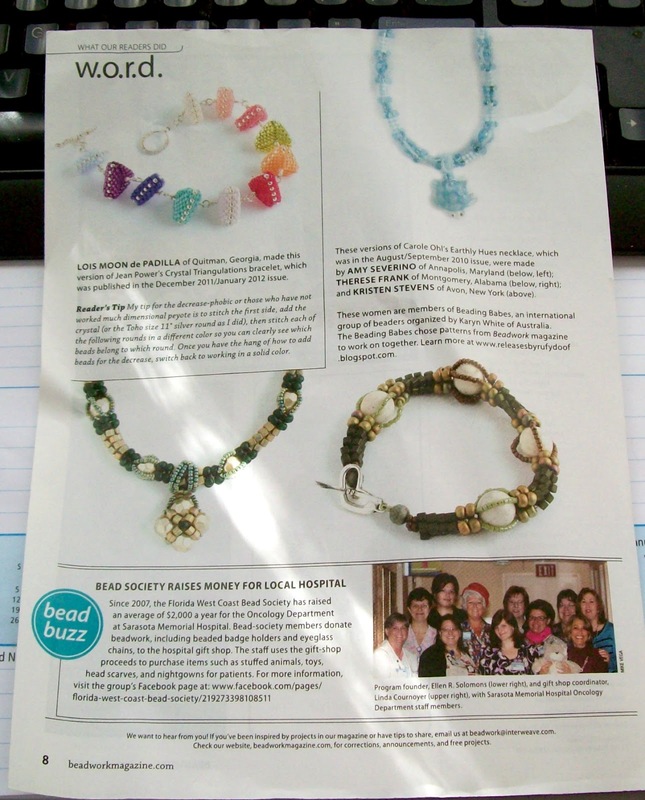 Oh, and congrats to Amy, Therese and Kristen for having their Beading Babes pieces featured in Beadwork! How awesome was that?! And thanks to Karyn for starting such a wonderful beading group...that's where I met most of you! Wow that's a lot of magazines on beading. You must be very patient and talented. I'm visiting on the A to Z Challenge. Great post. That is a ton of magazines. I've been collecting Beadwork and Bead and Button for quite a while also. I use white magazine boxes (a bit bigger than comic boxes) to store mine. My only problem is storing the boxes. :) And Congratulations on your necklace appearing in Beadwork. I was so excited to see the feature! I enjoy looking at magazines as well. Congratulations on your necklace design getting published!! Keep up the good work, and give yourself a pat on the back you deserve it! !